The Hebrew word shamayim occurs 400 times in the Scriptures. It is a plural word for things that are high up. In all languages, words can have different meanings, depending on the context. Sometimes shamayim can refer to the atmosphere, as when God continued to command fliers to fly above the earth in the face of the “raqiya shamayim.” (Raqiya is the noun of the verb to spread out, like a runner is the noun of the verb to run.) Day two: “Then God repeatedly commanded (Qal Imperfect), ‘Let there be a raqiya in the midst of the waters, and let it intensively, causally and in unbroken continuity separate (Hiphil Participle) the waters from the waters.’ God continued to make (Qal Imperfect) the raqiya to continually and intensively separate (Hiphil Imperfect) the waters which were below the raqiya from the waters which were above the raqiya; and it was so. God repeatedly called (Qal Imperfect) the raqiya shamayim. And there was evening and morning, day two.” Evidently the “raqiya shamayim” on day two refers to the atmosphere that spread out as water was ejected into space. 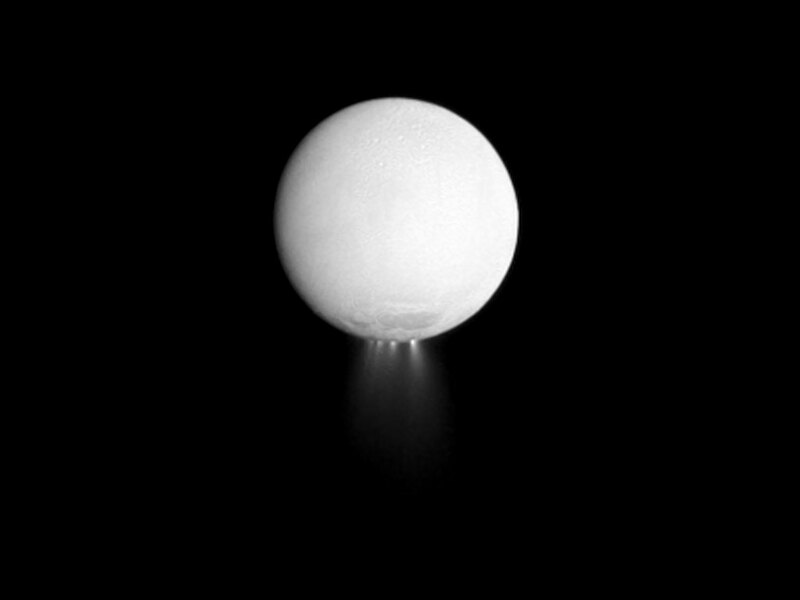 NASA photographed 90 geysers jetting water into an ice ring from the moon Enceladus. Instruments also detected a nascent atmosphere emerging along with the water. Proverbs 8:28 mentions God’s wisdom when he intensively made hard the clouds above, when the geysers of the deep were powerful. Dr. Frank, from the U. of Iowa, photographed 20 UV-absorbing streaks falling to Earth every minute. Snow balls falling to Earth absorb UV. Perhaps this is returning water, since comets and Mars have different deuterium percentages than local water. The picture of Encleadus is from NASA’s Cassini. The geysers are jetting out from near the south pole. Shamayim can also refer to the stars. Genesis 1:14-19. “Then God repeatedly said, (Qal Imperfect) ‘Let there be lights in the raqiya shamayim to intensively be separating (Hiphil Infinitive) the day from the night, and let them be for signs and for seasons and for days and years; and let them be for lights in the raqiya shamayim to intensively be shining (Hiphil Infinitive) on the earth’; and it was so. God continued to intensively make (Hiphil Imperfect) two great lights, the greater light to govern the day, and the lesser light to govern the night; and the stars also. God continued to set them (Qal Imperfect) in the raqiya shamayim to intensively be shining (Hiphil Infinitive) on the earth and to be ruling (Qal Infinitive) over day and night and to be intensively separating (Hiphil Infinitive) light from darkness; and God continued to see (Qal Imperfect) that it was good. There was evening and morning, day four.” The three references to “raqiya shamayim” refer to celestial lights that spread out. Notice how the Hebrew grammar differs from the traditional “ex nihilo” interpretation, based on the Latin grammar. The picture is from NASA’s Hubble telescope showing light from UV to IR in the Hubble Ultra Deep. 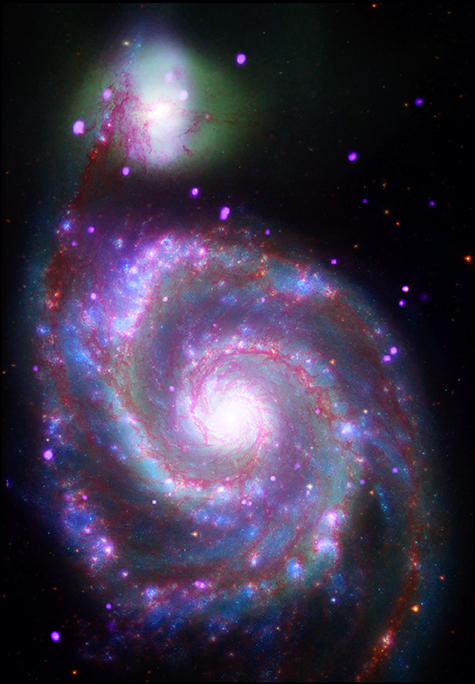 The spiral galaxy in the upper right is UDF-3031. It has two arms made of blue star globs with a child galaxy (yellow) at the end of one arm. What did the shamayim (Sun, Moon and stars) spread out from? Evidently they emerged from what God created first. First God created (Qal Perfect) the shamayim and the earth. The fourth Hebrew word (et) is not translated. It shows that God created the entire universe first. 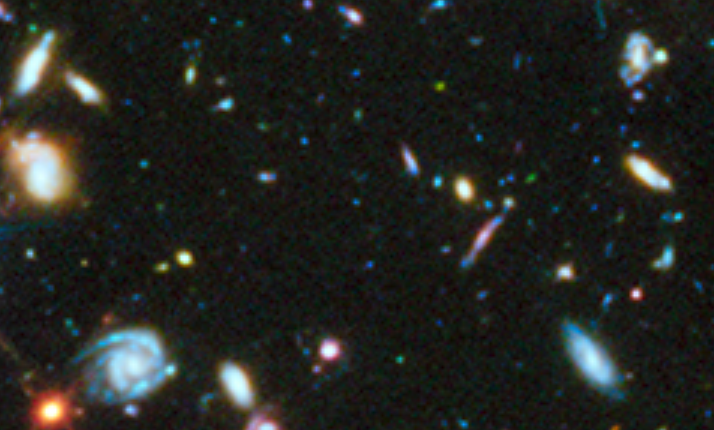 Could shamayim on day one refer to multiple unformed galaxies? What did the shamayim look like (when they were created)? We are only told that the Earth was unformed and dark. What happened when God’s wind intensively dithered in unbroken continuity (Piel Participle) over the face of the primordial place? Was it God’s continuing command for light to continue to be (Qal Imperfect verbs) that gave matter extension? Why is it that light continues to dither around within all matter? Is this what gives matter the ability to have extension? Cosmic history is the only continuum that is visible to the creation era. What we observe fits biblical cosmic history. Wait, doesn’t the Bible teach that the Earth is young? There is not a single reference in the Bible of a young earth? According to Hebrews 11:3, God commanded the plural eons to passively form from things unseen. Indeed we observe (at many ranges) how innumerable galaxies grew from “things not seen”, clearly supporting the reference to multiple eons. We even observe great bursts of gamma light periodically arriving from the creation era. It often shines from the areas where the arms of primordial galaxies were forming. Perhaps this is God continuing to energize matter with light, as per the literal text. Isaiah 44:24 I, the LORD, continue to actively (in unbroken continuity) make (Qal Active Participle) all things; actively (in unbroken continuity) I continue to stretch out the heavens and actively (in unbroken continuity) continue to stretch out the Earth by myself. I cause (in unbroken continuity) the omens of boasters to fail, Making fools out of diviners, Causing wise men to draw back and turning their knowledge into intensive foolishness (Piel Perfect). What we observe in cosmic history shows that God will make foolish the greatest system of humanist knowledge ever contrived by man, science. At many ranges we observe how trillions of star streams emerged from what is not seen as billions of galaxies intrinsically grew, often into local growth spirals. The atomic clocks, the orbits and the space matter takes up all change together, relationally. Even local atomic clocks, when compared to their transponded reflections from hours ago (Pioneer Anomaly), also blue-shift (relative to distance) just like the atoms in hundreds of billions of galaxies. (The fastest atomic clocks are local). Even our Earth has continued (in unbroken continuity) to spread out, as explained in the above text. The continents fit together on a minuscule globe and the ocean floors developed after the continents. The gif of the growing Earth is from Michael Netzer who allows its distribution with attribution. Scientists have invented the greatest system of mythology in history, the 99% invisible universe. They imagine that 84% of all matter is invisible. Why? No galactic stars follow their mathematical laws. They claim that 70% of all processes in the universe involve the spreading vacuum of space time that stretches light and pushes galaxies away. No one has ever detected any time, space time or light being stretched by vacuums. They even speculate that stars gravitated from space dust. We observe at many ranges how globs packed with stars emerged and spread out as small galaxies grew into large ones as the visible properties of all matter continue to change. How great will be the triumph of God’s word over science, the system that was historically founded on the false idea the Bible predicted for the last days. What idea? That all things that exist remain the same (see the Greek text for 2 Peter 3:3-6). Scientific definitions of matter and time, scientific empiricism, methods and mathematics were contrived with that presumption. Use your eyes to carefully test the notion, invented by medieval scholastics, that the essences of substance (its intrinsic properties) are changeless.